Unpredictable, unafraid and on the verge of an unprecedented appearance in European competition, TSG 1899 Hoffenheim are closing in on the perfect end to an incredible campaign. Does your Official Fantasy Bundesliga team need refreshing ahead of Matchday 30? Head here to make some transfers! “If you go to a concert, you don’t want to listen to boring music," the Sinsheimers’ 29-year-old coach Julian Nagelsmann said recently and the young tactician's metaphor rang true for those who witnessed Die Kraichgauer’s latest Bundesliga win on Saturday. A spectacular 5-3 success against Borussia Mönchengladbach drew plenty of post-match adjectives, but Naglesmann’s “breathtaking” proved the most apt. They are the very qualities that have also set Hoffenhiem apart this season. Currently third in the standings – one point ahead of Borussia Dortmund – last season’s relegation candidates will guarantee European football with one more win, while just five points from their remaining five games would deliver the holy grail: at the very least, a UEFA Champions League play-off. Varying their tactics throughout a season in which each player has been expertly managed and encouraged has provided startling results for the men in blue. Only one of three teams still undefeated at home [Bayern Munich and Dortmund are the other two] Hoffenheim are currently the division’s third-highest goalscorers. Indeed, suffering just two defeats in their last ten games has helped the side remain among the top four for the past nine matchdays. Describing Saturday’s opponents Gladbach as, "…one of the teams that I like to look at in the Bundesliga because they play good football, have a lot of very, very good footballers and play with a lot of pace out wide, no matter who plays,” Nagelsmann could have been describing his own side. Indeed, “no matter who plays,” lately, Hoffenheim almost always excel. After coming on to score his team’s fourth at the weekend, Uth’s goal was the 13th scored by a Hoffenheim substitute this season; 17 such goals is the Bundesliga record. The theory at the club goes that players need to come on early enough to give them a chance to make an impact. "We have a plan for every match situation," centre-back Niklas Süle explained. "Ours is an incredibly flexible system. We're more unpredictable to play against this season, which is one of our big strengths," the defender added. Champions Bayern found this out to their peril when losing to Hoffenheim for the very first time on Matchday 27. The Sinsheim side succumbed to Hamburg in their subsequent game yet it was their ability to respond with a win against Gladbach that highlighted another team trait: they appear unshakable. 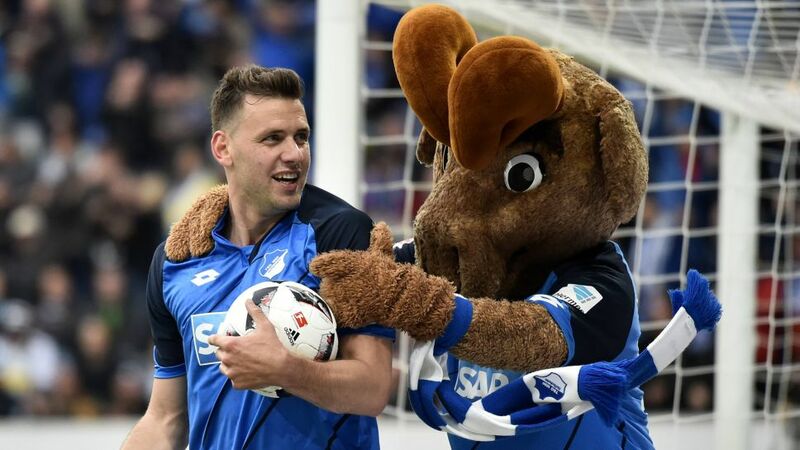 The last team to lose a top-flight game in Europe’s five big leagues this season, Hoffenheim are in ecstatic form as they tap on the door that leads into the grand hall of European football’s elite clubs. “What a cool match; what great goals!” goalkeeper Oliver Baumann enthused after the Gladbach win. With just five games to go, Hoffenheim are eyeing a “cool” finish to the season, and rivals Dortmund – awaiting just down the line on Matchday 32 – now appear the biggest obstacle to direct entry into the 2017/18 Champions League group stage.